Interstate Specialty Products die cuts hook and loop materials such as Velcro® brand products for mechanical fastening. Strong, easy-to-use, and long-lasting, hook and loop fabrics are made of woven, non-woven or knit materials such as nylon, polyester, polypropylene, and aramid fiber. These die cut textiles are readily converted into application-specific shapes and can be attached to glass or metal surfaces with an adhesive. Die-cut hook and loop fasteners consist of two fabric components, typically strips, circles, or squares. The first component has tiny hooks, and the second has tiny loops. When the two components are pressed together, the loops catch the hooks. The strength of the bond is function of how well the hooks are embedded, the amount of surface contact, and the strength of the force that pulls the components apart. Die-cut hook and loop fasteners retain their effectiveness with repeated fastening and unfastening. Soft, flexible, breathable, flame-resistant, industry standard, and military-grade materials are available. Die-cut hook and loop products also come in colors that support product designs. Die-cut Velcro can be sewn or glued onto opposing surfaces, but hook and loop fastening itself does not require the use of adhesives. Die-cut hook and loop materials such as Velcro are used in seating, clothing, insulation blankets, carpeting, cable ties, and wire management. Medical applications include orthopedic bracing, patient positioning, vascular and respiratory devices, drape closures, and medical monitoring equipment. Die-cut hook and loop materials are also used with textiles and clothing. Are die cut hook and loop materials right for your fastening application? 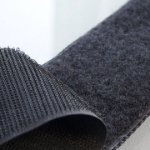 Interstate Specialty Products can recommend Velcro materials, or convert customer-supplied materials. We then use precision die cutting equipment to meet all of your application requirements. Slitting is also one of our many capabilities. To learn more about die cut hook and loop products from Interstate, contact us on-line or call (800) 984-1811.